Gardner Denver's GDNX, the company's next generation of fluid end technology. 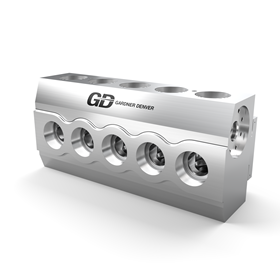 Gardner Denver Petroleum & Industrial Pumps has announced the launch of the GDNX, the next generation of fluid end technology, specifically designed to increase the operational service life of fluid ends used in hydraulic fracturing applications. Fracking applications demand high performance from pressure pumping equipment and the company says that the GDNX is a combination of its highest performing components. Some of the features of the GDNX include Gardner Denver’s Redline consumable, a series of aftermarket parts which extend product life by up to 3.5 times. It also has a patent pending cross-bore design that reduces operating stress and maintenance intervals by 3.5 times when compared to similar models. The fit, form and function of the GDNX are the same as the SGWS series, so it’s a direct fit to existing 2250/2500 pumps. All suction manifold, discharge flange and tie rod connections will remain unchanged from SGWS fluid ends, allowing GDNX fluid ends to serve as a direct replacement for SGWS fluid ends. The GDNX fluid end is made of stainless steel, with a service-friendly design which reduces maintenance time and there are no alignment requirements to suction covers to no special tooling is required to for installation.